Is there a landmark building near you that you’ve never explored. 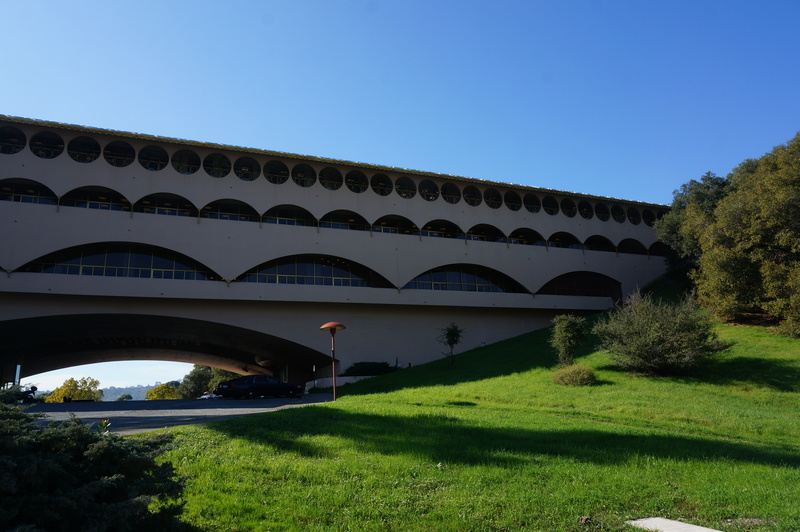 The Marin County Civic Center was that for me. Though I’ve driven by it many times over the years, I’d never taken the time to go inside. A recent story assignment propelled me to take a tour and I thought I’d show you a bit of what I saw. 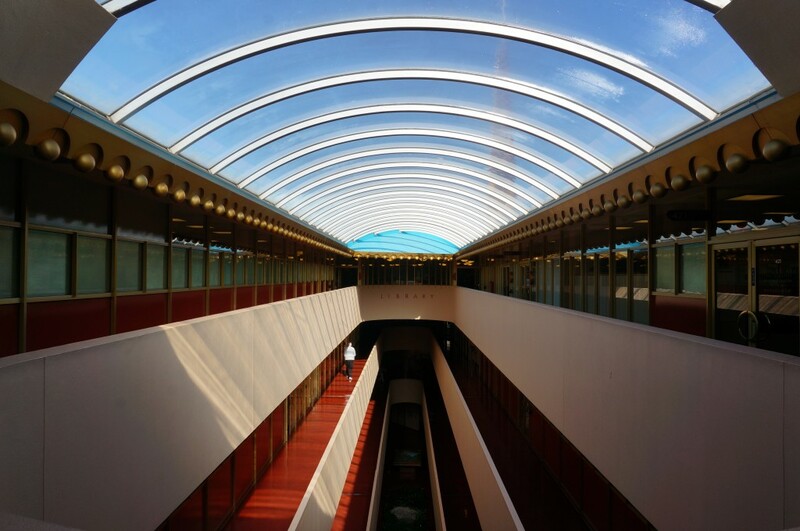 Along with nine other Frank Lloyd Wright-designed buildings, the MCCC has just been nominated by U.S. Interior Secretary Sally Jewel for inclusion on the World Heritage List of significant cultural and natural sites. 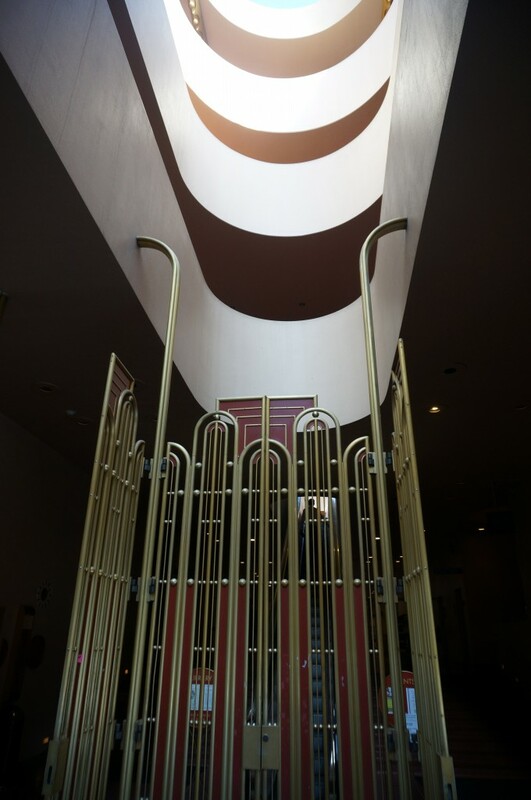 It was the last building designed by Wright and though he died before he could see it completed, his vision continues to inspire and delight visitors nearly a half century later. Finished in 1969, the two long horizontal buildings connect three grassy hills in southern Marin County—a landscape that Wright said was one of the most beautiful he’d ever seen. A central dome topped with a 172-foot gold spire “punctuates” the entire complex that has been featured in several sci-fi films and served as the inspiration for the buildings on the planet Naboo in Star Wars films. 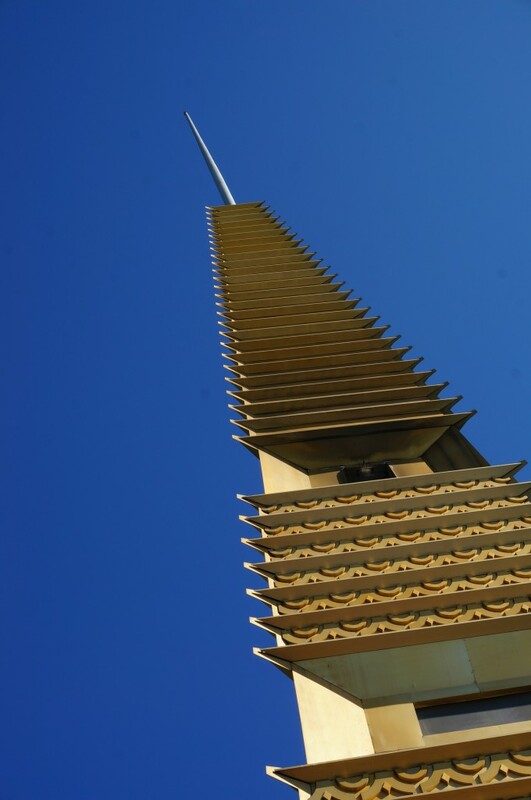 You can see a strong Japanese influence in the intricate detailing on the spire and elsewhere in the MCCC. As well as circular motifs that Wright thought would enhance the building’s flow. 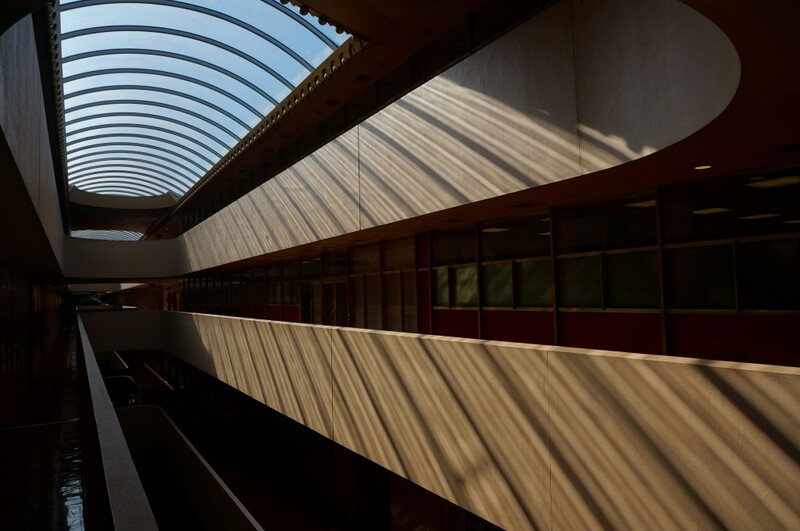 The floor plan features a central atrium topped by curved skylights that cast interesting shadows throughout the day. 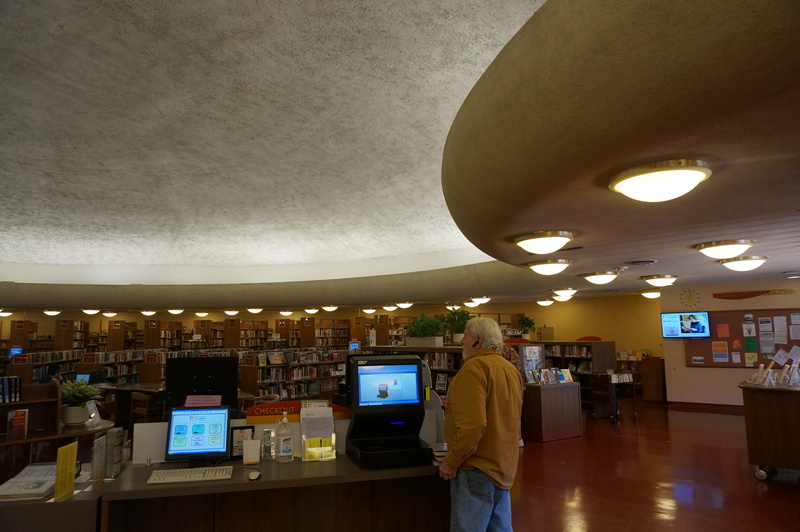 And in the space-age domed Library. It’s said that Wright’s favorite colors were gold and red—particularly the brick red known as Taliesen red (named after Wright’s school of architecture) that you see on the terrazzo and composite tile floors at the MCCC. The color seems more Southwest than NorCal, but I guess you could say it’s a kissing cousin to Golden Gate Bridge orange. 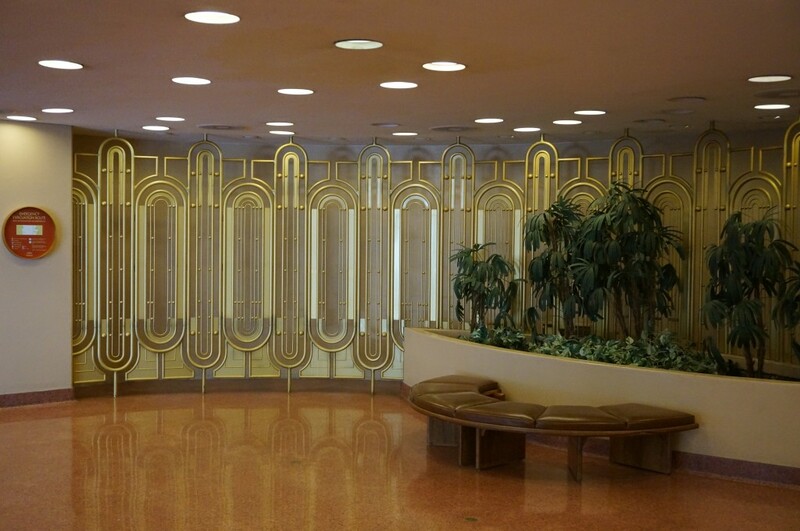 The interior walls are sandstone color but lots of gold details light up corners and exterior walkways. 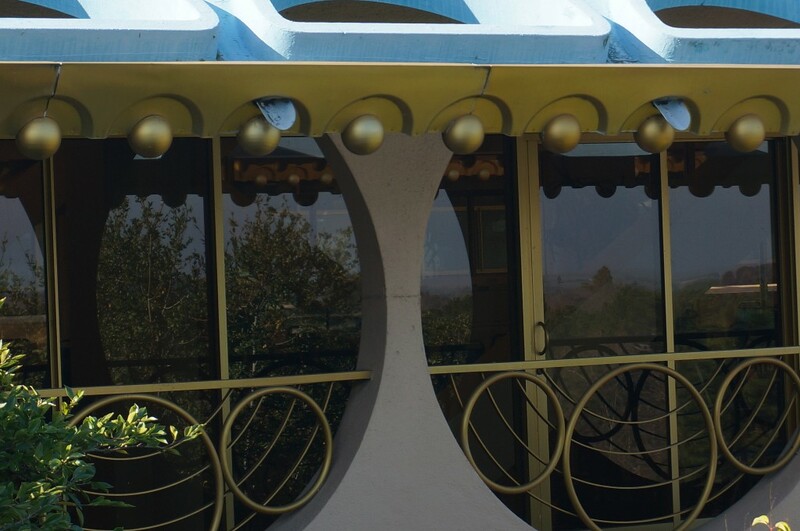 Initially the entire roof was supposed to be painted gold. 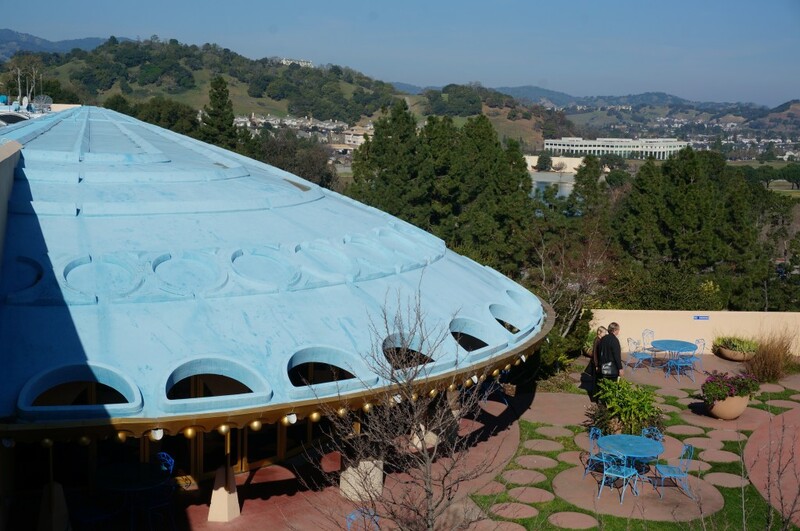 However, when a weather-resistant gold paint couldn’t be found, the roof was painted blue to blend in with the sky. Docent-led tours of the MCCC are offered every Wednesday morning and begin in the 3rd floor cafeteria where you’ll also find an alcove devoted to newspaper clippings, drawings and artifacts from the time. You can also download a self-guided tour. But be sure to step into the cafeteria to peruse some of the artifacts. Fascinating stuff. Easy to access. What took me so long? 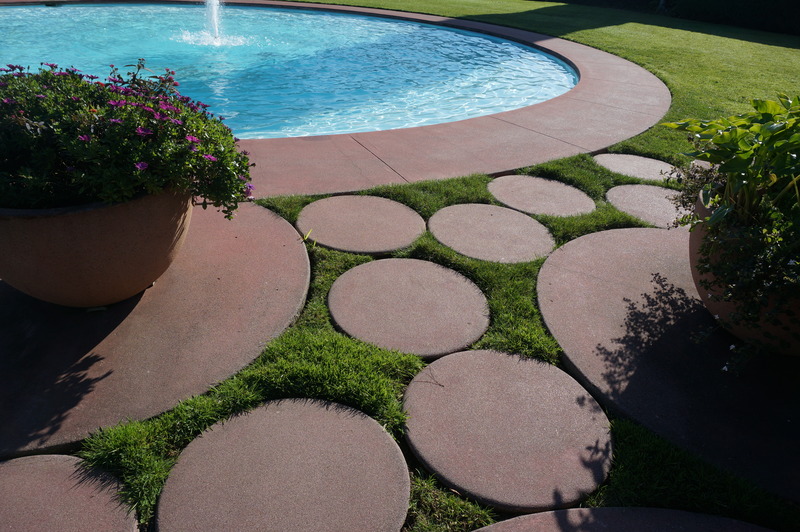 Is there a nearby historic landmark you’ve always wanted to see but haven’t? If so, what’s holding you back? 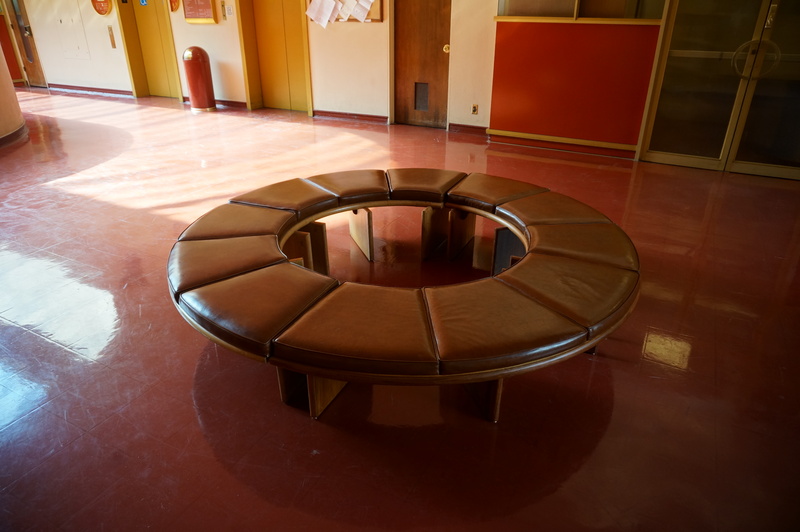 This entry was posted in Shelter, Style and tagged architecture, Bay Area, Frank Lloyd Wright, interior design, Taliesen Red. Bookmark the permalink. Post a comment or leave a trackback: Trackback URL. I grew up in Marin and so was very familiar with the Civic Center. 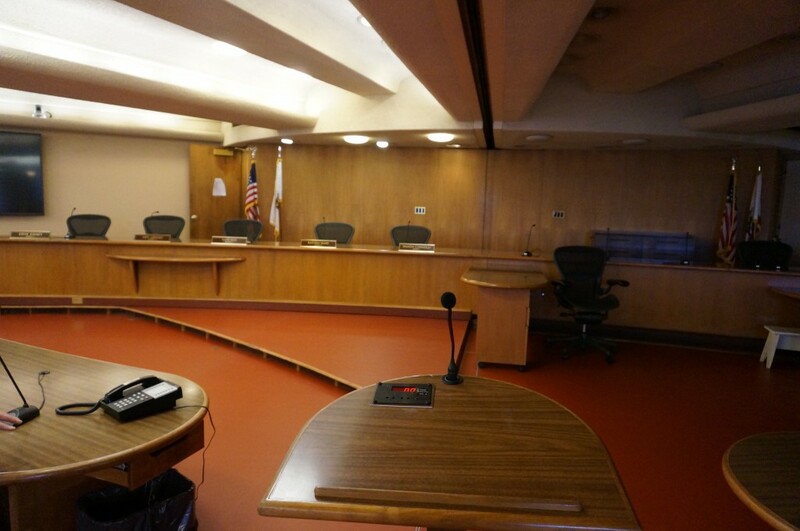 In fact, that’s where my then fiancé and I got our marriage license years ago. In high school I remember visiting the library. 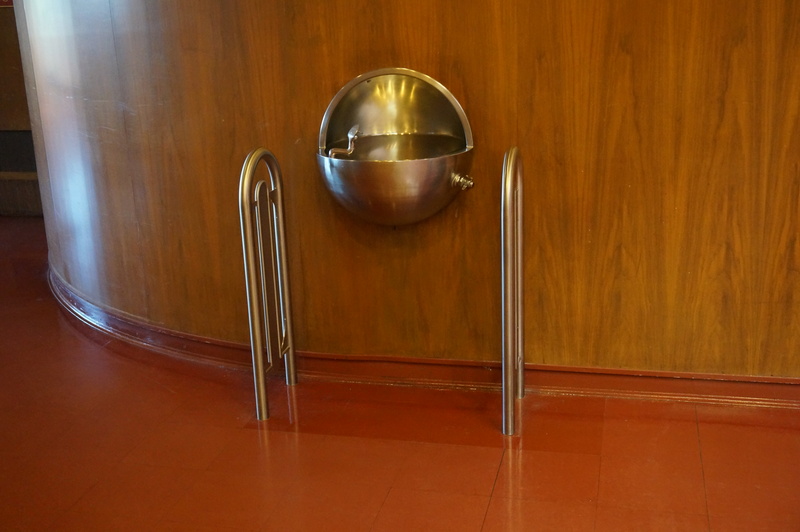 Even as a teen I was struck by the inefficient use of space, what with the curves. I think they have problems with roof leaks as well. Anyway we saw many examples of FLW’s prairie style in Oak Park. It is hard to believe they were designed by the same person! 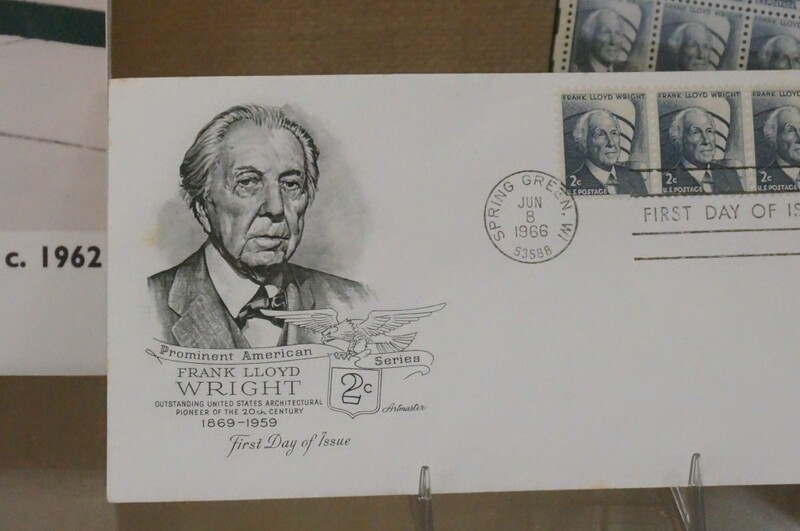 Well, FLW was all about reinvention–for better or worse! I’d love to see the Oak Park buildings myself.